Planning Commission Rejects Truck Stop: A Lesson in Showing Up BIG! When you show up, are well informed and are persistent, you often win and Retake’s city and state strategy is to make it easier for you to show up for affordable housing, for renewables, for fair elections, and more. Also today, Brave Space, a new local radio show focused on feminism. Read on. Today’s post includes info on the Pilot Flying J truck stop decision, a new radio show, Brave Space, developed by and for women, and encouragement to attend the KIDS COUNT! Conference this Thursday. Finally, if you can afford to donate $10, $25, $50 or $100, we could use the support. While the developers felt that their plan was consistent with land use guidelines, former City Attorney and current County Planning Commissioner Frank Katz, disagreed: “But that language doesn’t justify the location of a trafficky, ugly, smelly, noisy truck stop that is not an allowed use,” he said. “The staff has directed us to decide — quote — whether or not the use of a truck stop should be recognized as a conditional use. I find that a truck stop cannot be reasonably construed to be a conditional use. Within the [Community College District], the plan can’t be approved as submitted.” Others on the Commission agreed. The next step will be a hearing before the County Commission. We will keep you posted. Contacting elected officials and showing up at key moments is participatory democracy, it is the only way we can ever achieve justice in Santa Fe, in New Mexico, or in our Nation. Retake tries to make it easier to be engaged, informed and active. For example, our Speak Up New Mexico! our Legislative Priorities Survey is one way to raise your voice. Feminists grappling with feminist issues in Northern New Mexico. We Break it Down. Beginning tomorrow, Saturday, March 17 @9am MT and every Saturday thereafter, one of Retake Our Democracy’s Leadership Team members, Cecile Lipworth, along with a brilliant group of women, will be hosting BRAVE SPACE – a new, live radio show on SantaFe.com’s 1260AM KTRC or 103.7FM. So on Saturday’s at 9 you can venture into a Brave Space and then at 11, you can turn the dial to KSFR 101.1 FM to listen to Retake Our Democracy with Dede Feldman this week, and Mayor Webber and Senator Wirth each featured in coming shows. A great Saturday double header. Brave Space will be collaboratively developed by New Mexican women, all with different backgrounds and perspectives, wanting to share ideas, inspirations, and reflections about the feminist ecosystem in Northern New Mexico, nationally and internationally. Its cohosts will be drawn from the community of women throughout northern New Mexico who are involved in and adjacent to feminist work and will each have their own specific knowledge and skills with a distinctly feminist lens. The format of the show will vary; at times there will be a group of New Mexican women having discussions, other times the show will host guests regarding specific issues, but whatever the format, Brave Space will always keep feminism at the center of the conversations. During the live show, Brave Space hosts will also be able to take calls from listeners. Together Brave Space wants to break down what feminism is today; it will bring our professional analysis and personal experience to the forefront to discuss what women are challenged by and what women are inspired by. Lipworth and her colleagues were inspired to call the show Brave Space from a poem by Micky Scottbey-Jones. Just like the poem says, Brave Space wants to amplify voices, specifically from our community, as well as bring in other perspectives with the goal being not to achieve perfection, but to explore and achieve greater understanding, deep learning and new relationships. Brave Space welcomes all women as part of our conversation: women who identify as women – those born as women, those who self identify as women, women who love women, women who love men, women who love all. For the launch show today, Cecile Lipworth will be with Patricia Trujillo, director of Equity & Diversity at Northern New Mexico College, and Renee Villarreal, Santa Fe City Councilor and Co-Director of Programming at NewMexicoWomen.org. The Northern New Mexico KIDS COUNT Conference is just one week away! This looks like a great conference. 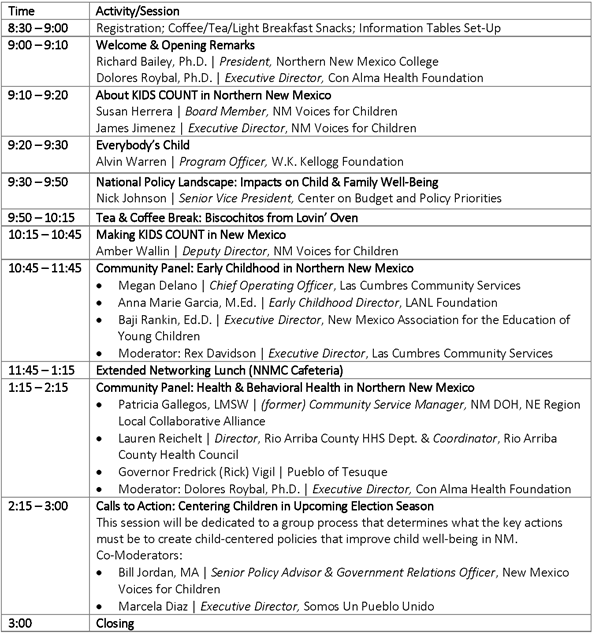 Northern New Mexico KIDS COUNT Conference next Thursday, March 22! They’re almost at capacity, so register here NOW! why this planning is rejected?